Handmade Leather Belts available in various sizes. Please note belt lengths are given as belt size is different to waist size. To get an idea of the size required please measure one of your own belts and compare it to the given belt length. Please note styles can usually be made in different sizes, please contact us with your requirements. 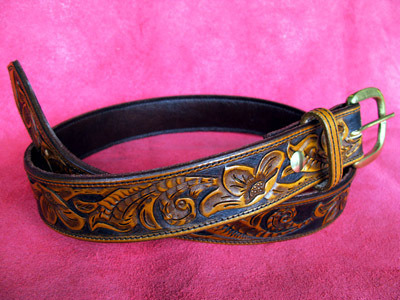 Custom designs available including handtooled Western belts.